Great White North is a half-ironman distance triathlon held in the city of Stony Plain, just west of Edmonton, Alberta. It was our first time participating in this event and with it highly regarded in our "neck of the woods" as a great event, we were stoked to experience it for ourselves. This year marked the 25th anniversary of this event. We took the 10 hour drive and divided it up into 2 days as it made sense to drive part way in the evening on Thurs to make the drive Friday easier to make package pickup/check in later that day. We took our camper with us despite a lot of indecision about it. There is a lot of work involved in getting the camper ready for the first time of the season and it wasn't time we really had available. However, we dislike staying in hotels more than we disliked being squeezed for time, so camper it was. I am a teacher so my last day of work was last Thursday. We left for Edmonton right after I got home from work Thurs so it feels really nice to be home this week and be able to set my own schedule. I am slowly making piles of things to pack and will probably get my last bike ride in Friday morning to get my bike packed up that afternoon. First night was at a Saskatoon, Saskatchewan Walmart parking lot, along side about 4 others who had the same idea. The nice thing about staying at Walmart is that you get started early in the morning. If you like to sleep in and mosey on when you feel like to it, Walmart won't be for you. Between traffic, garbage trucks, people with loud mufflers and possible trains you may be up before the sun. On the road early on Friday with great driving conditions getting us into Edmonton by noon. We decided to make a few stops (MEC- for hiking boots and socks and Sport Chek for Nuun) before making our way to Stony Plain for athlete check in. The parking lot was empty as we were almost an hour early so we cranked out a couple chairs, cooked some supper and enjoyed some fresh air. There was warnings of line ups for check in and indeed their was. Not crazy long but certainly a wait. We got our bags, chips and looked around the few booths, bought nothing and left. We spent the night at another Walmart parking lot at nearby Spruce Grove. Wished we would have seen the railroad tracks in the bush right behind the store. Not much sleep that night. Saturday morning, 5 mile run followed up by a leisure oatmeal at Starbucks. It was great to have no big rush. We showered, then spent an hour sorting all our gear into their appropriate bags. This race has 2 transitions so we took our time to plan well. 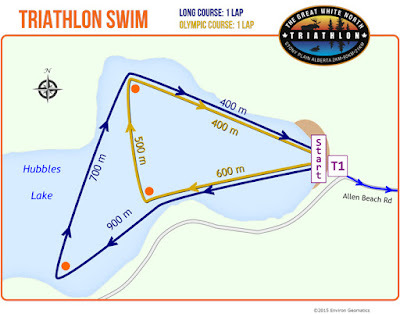 Our bikes got dropped off at T1 which was at Hubbles Lake where the swim was taking place. It is a private beach so it was a drop and go with no swimming. We tried to get up to the lake for an open water swim before coming to the event but it didn't work out so we were hoping we could have a bit of a swim here. Oh well. Next was the running bag drop off at T2. We were staying that night at a campground right across the road from the pavilion which was the location of T2, the run start and finish and the post race festivities. We spent the next couple hours browsing for nothing in particular just picking up a few camper things; a broom, extra fuses, bowls. Supper was one pot sweet potato with chicken and spinach back at the campsite along with a few hours of kicking back, reading and resting. Tattoos applied and alarms set ready for Sunday! Up at 5, showered, breakfast of oatmeal, hair braided and off with our 2 bags to catch the bus at the pavilion. Transition was busy as usual. Only needed age marked on one leg. Found a bike pump to borrow and set my things up. I choose to bring along all my nutrition that morning rather than leave it with my bike yesterday. Extra to carry but worth having it fresh and cold. Porta potty line was pretty long so by the time I was out of there, it was time to get ready. I drank 1/2 bottle of UCAN, Body glide, tri slide spray and wetsuit on. A bit of sunscreen on my face and arms then off to the beach. Morning temp was +15 with rumour of water temp being close to +20. Seemed very unlikely in my opinion because nothing is warm yet this far north yet and I was told the lake was clear, deep and spring fed. I was determined to get a good practice swim in though so in I went. To my surprise it was very warm. No complaint from me. The bottom was very murky and spongy for a ways but the warm up went well. I concentrated on relaxing, breathing easy and not panicking. Seems to be something I do well at the beginning of each swim; panicking that is. We were all marshaled to the start corral and so far my only complaint would be that there was confusion about where exactly we were swimming. The first buoy was around the corner and we couldn't see it or where to go from there. I guess that is the hardship of being up front- you need to know where you are going. Not going to be my problem today. Race horn off and I was in the water in the back 1/3. Good news was no panic, bad news was it took so long to find my rhythm with so many people around. I didn't hear the exact number of participants but around 600. Once I got into the groove, it was so much better. So much so that I was surprised when I was almost back at shore. Wetsuit strippers were there to assist and unfortunately my watch got hit in the process and messed my time up but I adjusted. I also didn't anticipate the full sand beach and dirty feet that would result. Duh. The only thing I had to rinse them was a little bit of extra water with Nuun. Dried them well before putting on my socks. I get blisters easily so I am very caution. Still a beautiful sunny day, with no wind yet in this sheltered lake area. It was an absolutely perfect swim. Couldn't get any better. The bike route was 2 loops from town north. Lots of people cheering on the streets in town but pretty quiet on the out and back. My husband so badly wanted a coffee this morning and with nothing open I was wondering how hard it would be for him to ride past Tim Horton's 2X without pulling through the drive thru on his bike. We rode the bike course Friday evening so we had a good sense of where the turn around was and the topography of the area. 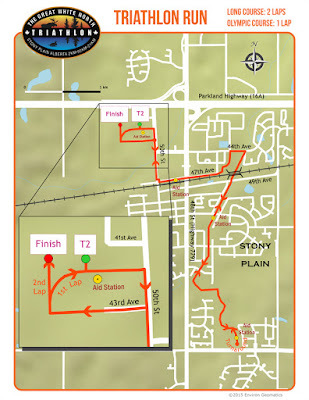 The course starts out pretty flat and then has a gentle incline for maybe 4-5 miles with a couple bigger hills to follow. The next few miles were really fast down hills where you can get some serious speed. I was in the biggest gear and could not pedal any faster. Obviously then after the turn around, it was uphill for quite a bit but then cresting the hill brought the gentle downhill section where you could really push. Roll into town to a lot of spectators cheering then off on lap 2. Stopped at the porta potty a few miles down the road and ate my UCAN bar. Mentally I was in a good spot, no negative thinking and was really enjoying the ride. The bathroom break and bar really ramped up my energy. Sometimes a short break brings real renewal and energy. 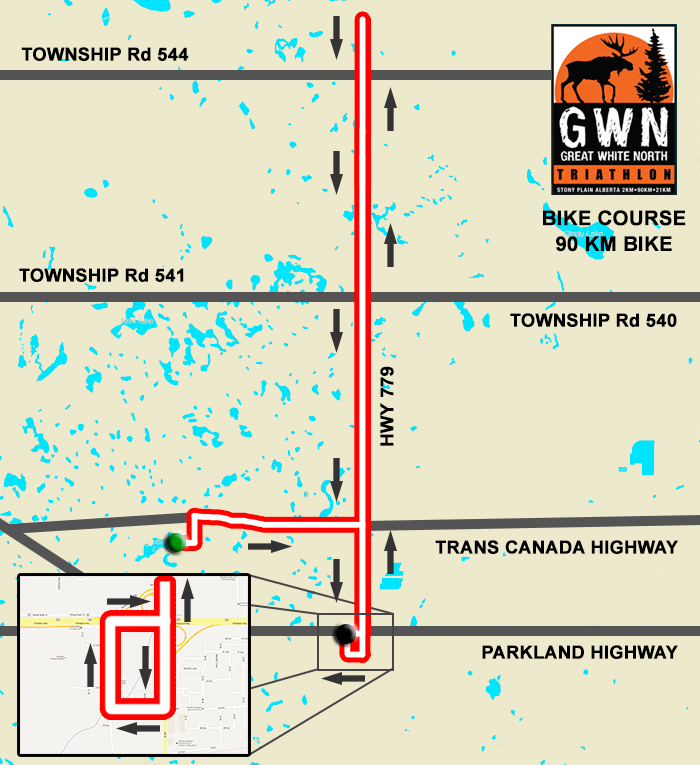 The ride course follows highway # north of Stony Plain and it is mostly through forest. The slight south wind helped with the out sections of the bike and there did feel like a bit of a headwind returning to town on lap 1. A few miles left in lap 2, it became apparent there was a wind shift more toward the west. The tree line was very sheltering so we were mostly untouched by the wind's effects. A few miles from town, things open up and you could feel the side push of the wind. The weather was predicting a thunderstorm today and though the day had been near perfect so far, a few cracks of thunder and a now cloudy sky indicated things might change. I looked to my right and there was a massive wall of dark cloud with what appeared to be a down pour coming from it. My legs went into high gear as it looked like I may be just on the edge of it. 5 minute downpour and I was out of it. Felt really bad for all those behind me. They would have been riding through interesting conditions. So just after 3 hours in, I was back in transition. No rain here at all. T2 is a gravel parking lot. They put long carpet runners along the middle of each row so it is easier to roll your bike to its spot. There were a lot of volunteers helping each racer find their spot in transition. Quick change of socks and shoes and lids then hit the run. I encountered my first mental struggle as my watched beeped 1 mile. I thought oh man, 12 more to go- that's so far away. It wasn't that I couldn't do it, it just seemed so far. Almost each long workout has a time where you sternly tell yourself to turn the brain off and this was the time. No thinking just running. I had a gel flask bottle in my back pocket of my jersey with a scoop of UCAN in it. Just needed to add water around the 5-6 mile point. It was quite sunny and warm, at least +25. The run route had lots of twists and turns. I usually like to divide my run into section but it became apparent to me that this would be too hard to section off because I couldn't keep track of all the switching of roads and turns. Just run. There were few spectators along the run course. Soon I saw hubby running toward me and not long later, I was at the turn around point and heading back to transition. It is always VERY hard when the loop splits to finish line this way and second loop this way. You can hear the announcer, the cheering, smell the food, see the others heading to the finish line and you are needed to run the loop again. I actually planned to take my fuel at the aid station just prior to the finish/turn around area knowing that I would need to be at my best to mentally handle the wall. Second loop went well really. I think I was in autopilot, just running the same 9 min pace with 20 second stops through the aid stations for water on my head or a mouthful. It is a silly thing to say that I could have ran faster because if I could why didn't I. My heart rate was right in the 146-152 area and I felt good. If I pushed it, I would be uncomfortable and I just didn't want to. I thought it was a better plan to run the same pace really consistently than to do what appeared many others were doing which was the surge then walk routine. 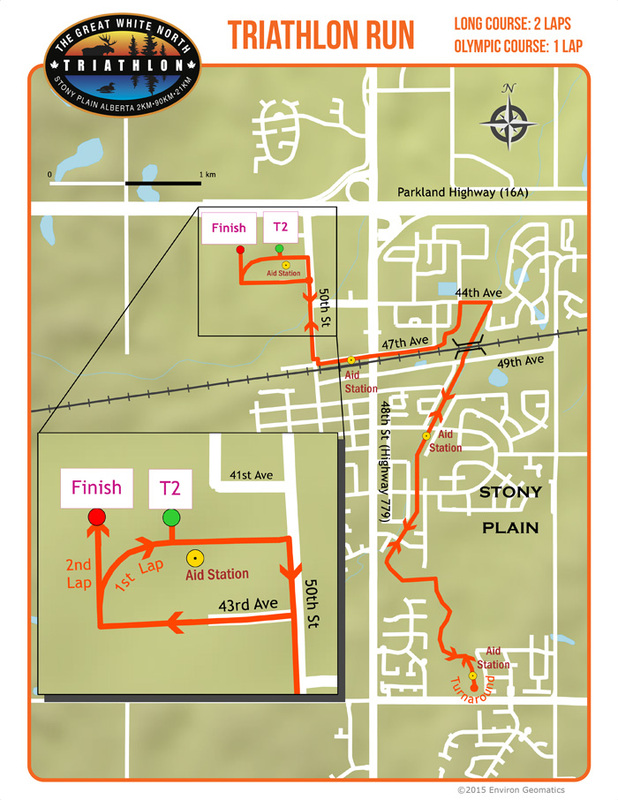 I thought I passed a lot of riders during the bike leg, but I passed way more on the run especially the second loop. Saw my husband again just before the turn around. He told me to catch him. It seemed he should have been a long ways ahead of me so I thought he might be having an off day. I did pick up the pace to about 8:45. Oh it feels so good to hear the announcer as you are heading to the finish area! Strong finish with a medal immediately put on my neck. Saw my husband waiting for me right there and we hugged and headed into the building to find some shade. I went back out to claim my finisher shirt and buff then back in to sit for a bit. Stood in line for our hamburger, chips and beer. The beer is from a local company with a special edition made just for this event. We searched for a friend we knew was also at the event but was unable to find her so we picked up our 2 bags from the morning and headed out to transition to get our bikes. Very windy now outside, quite appreciative it wasn't like that during the bike. Showered up at the camper and packed things up to leave. On the road by 4 with a stop for more special edition beer and a coffee from Starbucks. -amazing swim site at Hubbles Lake It was clear, clean, warm and well protected. -very little volunteer support during the swim in terms of kayaks etc. -not really clear at the finish area where to find things or where to go. Now the exciting news for me- my official time gave me an almost 35 min PR. Boy does it feel good when my body is working right!! Hubby also got a PR and he had an off day! I can only imagine the damage he could have done if it was a good day. It is very assuring to see that hard work produces results and improvements. Very happy to see we only need to make small adjustments to our nutrition plan.